Detailed below are the instructions on how to set up term dates in ATLAS Scheduler app. These instructions are for users who have been granted administrator access to the app. If you have been granted admin access and you follow these instructions, but it seems like options are missing or that the app isn’t working, it may be a technical issue. Email ATLAS at atlas-apps@illinois.edu for additional support if the guidelines below don’t answer your question(s). First: Navigate to your ATLAS Scheduler homepage. 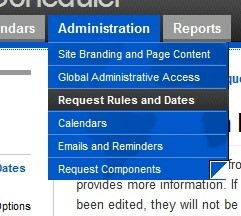 Next: Hover over the “Administration” tab in the upper left-hand corner and click “Request Rules and Dates”. Term information is listed here. By default the dates are pulled from Banner, but can be edited manually. Locate the term name and click “Edit” directly to the left. Change the dates as necessary. Name - display name for the term. Term Start - official start date of the term. Term End - official end date of the term. Single Request - earliest date that users can create a single request for the term. Single Request - last date that users can create a single request for the term. Priority Request StartÂ - earliest date that users can create a priority full-semester request for the term. Priority Request End - last date that users can create a priority full-semester request for the term. Full Term Request Start - earliest date that users can create a normal full-semester request for the term. Full Term Request - last date that users can create a normal full-semester request for the term. Earliest Request Date - earliest date that an event can occur for the term; for example, if the term starts on 1/1/2007, but the Earliest Request Date is 1/5/2007, a meeting time in a request would not be able to be set before 1/5/2007. Latest Request Date - latest date that an event can occur for the term. For example, if the term ends on 12/20/2007, but the Latest Request Date is 12/15/2007, a meeting time in a request would not be able to be set past 12/15/2007. Suggested Request Start - start date suggested to users when making a request for the particular term. Suggested Request End - end date suggested to users when making a request for the particular term. Click “Update” on the far left when finished.